In my pursuit of Hello Kitty perfection, I've made a second batch...There will probably be a third. Stay tuned! Challenge Thyself. That was the decree for this week’s #SundaySupper. Those who gather round the virtual dinner table at Twitter on 28 April at 7 p.m. ET will discuss their triumphs, defeats and lessons learned from making a recipe never tried. You are definitely invited to share your experiences. Scroll down to the comment box. Also, at 7 p.m. ET, type in #SundaySupper in the Twitter search bar and join the conversation. Conni, the Foodie Army Wife , whose stellar photography of her dishes and desserts motivates this Ninja Baker to save and try every one of her recipes, hosts the event. 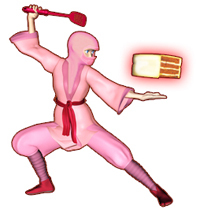 The Ninja Baker picked Rice Krispie Treats as her challenge. Go ahead – laugh! The truth is I had visions of scrubbing melted marshmallows off the bottom of pots at midnight. And seeing my 13” x 9” pans messed up with the sticky stuff. The reality – as it turned out – was an easy-to-make treat. Click here  for the recipe. It helped, too, to line the 13” x 9” pan with foil sprayed with butter flavor cooking spray. Also, I appreciated the admonition of an experienced Rice Krispie maker-friend who said the stuff sets pretty quickly. Armed with the knowledge I was able to cut out cat heads with my Halloween cookie cutter in a timely manner. My goal was to create Hello Kitty Rice Krispies. Some of the sweetest little girls live down the hall. It appears they are fans of the popular Japanese pop culture import. So, I wanted to surprise them with a treat...All right, I confess, this grownup is a Hello Kitty fan, too! Kiana & Kayla: Posing with a plate of Hello Kitty Rice Krispies. I was happy with the Hello Kitty bows snipped out of fruit wrap, attached with buttercream and topped with a fondant rose. Fruit Wraps work well for Hello Kitty bows. For whiskers, I was sure that Japanese Pocky biscuits would be perfect. Not so much. Next time I’ll pipe on whiskers with chocolate frosting. Another popular Japanese import: Pocky! And the M & M eyes and nose may have been a tad too big, preventing the treat from being an uber-cute Hello Kitty. The taste of the Rice Krispie treats was fine. They definitely needed the touches of chocolate though. Surprisingly, the treats were not very sweet. My choice of vegan marshmallows may have contributed to the unexpected taste. So, live and learn. Notes for next time. I invite you to join me in learning from the following food bloggers about their #SundaySupper make-something-new challenges. Wishing you treats and triumphs.